PLATINUM BOUNCE is all about the sound of hits – fat beats for the radio and the hottest clubs. After the hugely popular iMASCHINE Expansion SWAGG CITY, comes the mother lode of urban flavor – PLATINUM BOUNCE brings the fresh sounds of today’s urban pop to MASCHINE and MASCHINE MIKRO for the first time. The included kits, patterns, and instruments are tweaked for maximum upfront response – get ready to bounce to this. Whether you make hard-hitting hip hop, dirty south beats, RnB, crossover club anthems or any other type of urban pop-based music, this is the ultimate urban nightlife soundtrack. Packed full of booming kicks, popping snares, tight percussion, fat bass sounds and clean synths, PLATINUM BOUNCE provides the perfect building blocks for beats that will tear up the club and the radio airwaves. 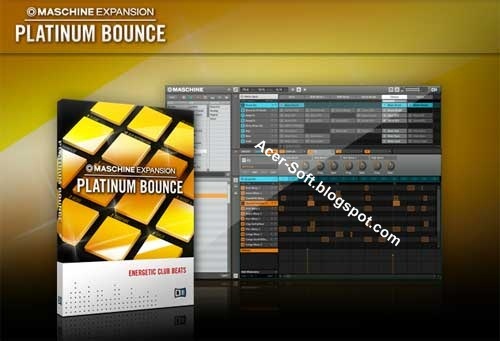 The PLATINUM BOUNCE Expansion comes with an inspiring variety of projects and patterns. White-hot pre-programmed rhythms provide a starting point for new creations, or remixing old ones. From massive half-time beats at 65 BPM to pumping double-time electro beats at 120 BPM: All patterns and sounds were created by professional music producers and top sound designers. PLATINUM BOUNCE contains 54 instruments, made up of 16 pads, four organs, 17 leads, eight keys, and nine basses. The instruments are derived from classic synths such as the Minimoog, Oberheim SEM, and Jupiter-6, among others. The 45 drum kits contain a well-rounded selection of hard-hitting drum and percussion sounds, all tweaked and processed for maximum impact. The eight included Melodic Kits provide harmonic one-shot sounds including brass, guitar, piano, and strings melodies – a great way to kick off track ideas.